This Hybrid monofin is for the freedivers who don`t want compromise. The blade is hand laminated with Carbon and Kevlar, highest performance and a lowest weight strongest fin on Earth,unbreakable. The angle (protected with rubber reinforcement) between the blade and the footpockets makes it very effective especially for constant weight diving. Angle decreases the amplitude of the stroke,saving the energy by this way,in the same time it increases the forward power. The blades stiffness and characteristics have been developed and improved with experience from earlier products.The wing construction reduces turbulence and stabilizes the fin. The fin is easy to control in the water and you can use it for hours, thanks to the comfortable footpockets.For additional protection the top of the blade is equipped with a fiberglass stripe. 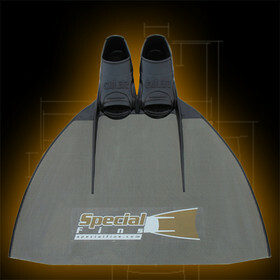 All Freediving fins come with a one year warranty for materials and craftsmanship.